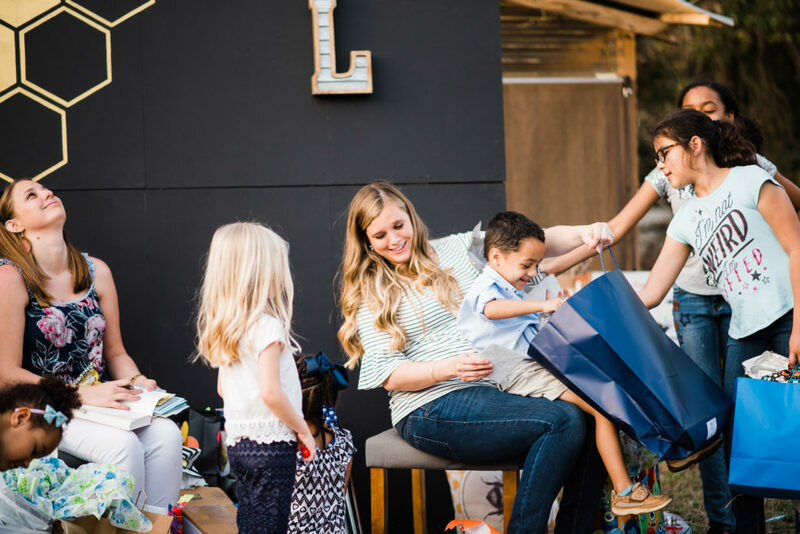 Baby showers are such a special time to gather friends and family to celebrate the new mom and baby and the exciting adventure that will await them both! 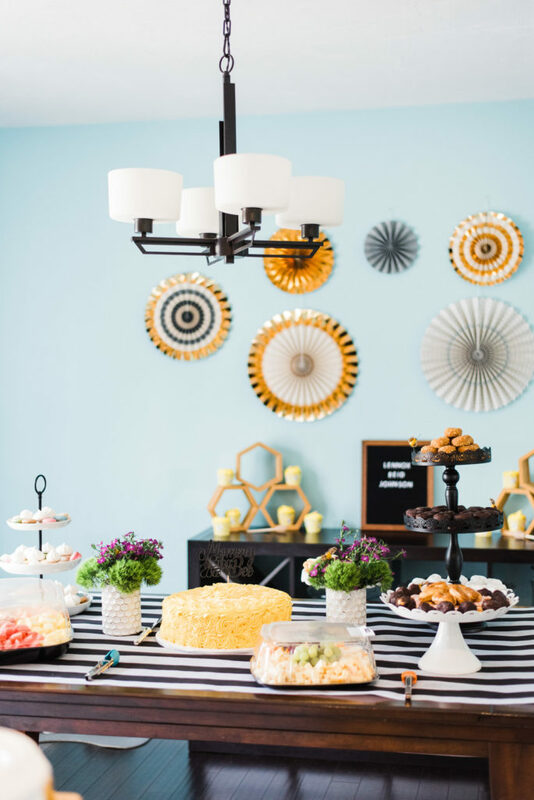 There are so many options when it comes to party themes, but we fell in love with this sweet idea and are so excited to share the design inspiration with you today! 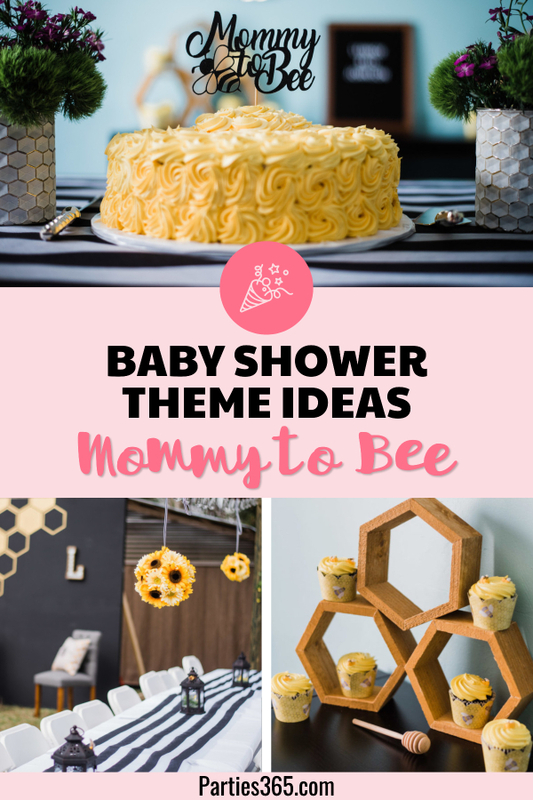 When this “Mommy to Bee” was expecting her second child, her sister Kristen Woolsey of Pugs and Pearls, dreamed up a beautiful bumblebee themed baby shower and the party was stunning! Scroll on through the pictures and see what the buzz is all about! 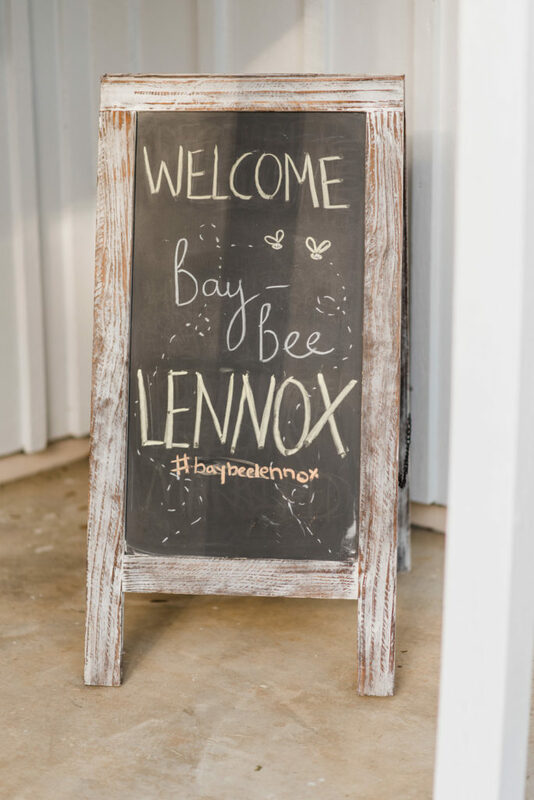 To kick off the “bay-bee” shower theme, guests were greeted upon arrival with this darling welcome sign with the baby’s name and a custom hashtag for the party. 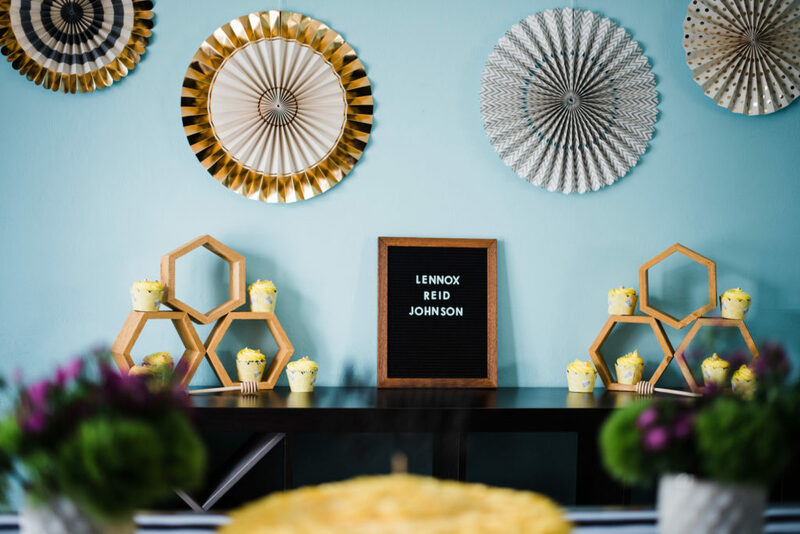 Inside, the new baby’s name was displayed on a stunning feature wall with gold metallic paper fans, wooden honeycomb shelves and adorable beehive cupcakes. 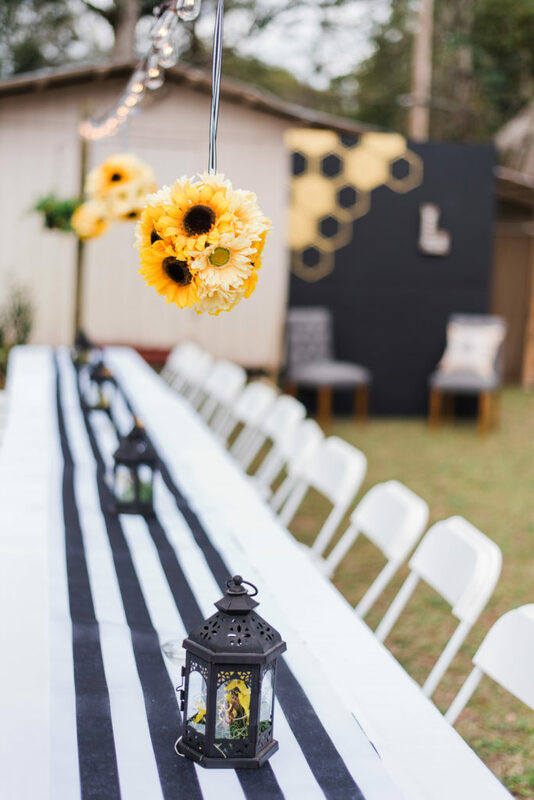 Seating for the party was setup outside and long tables were topped with black and white striped table runners and simple black lanterns for decor. 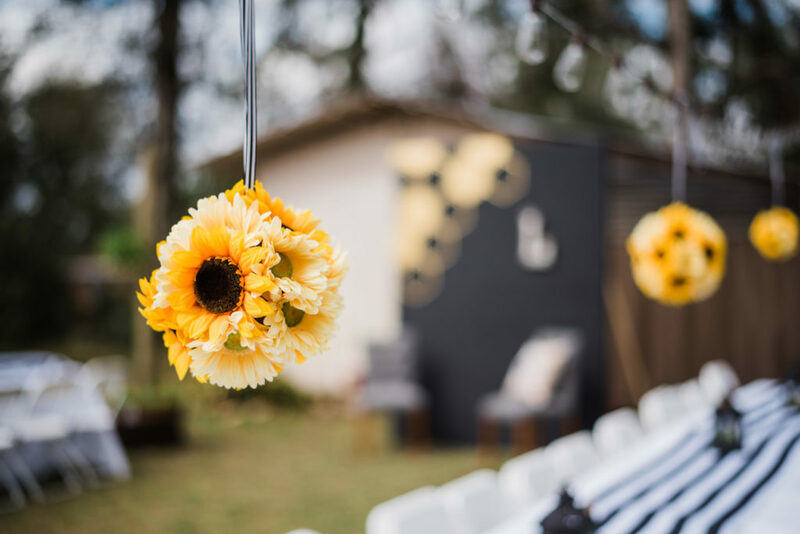 Party lights stretched the length of the tables and bright sunflower poms, created by family friend Neena, hung down for a beautiful pop of color! 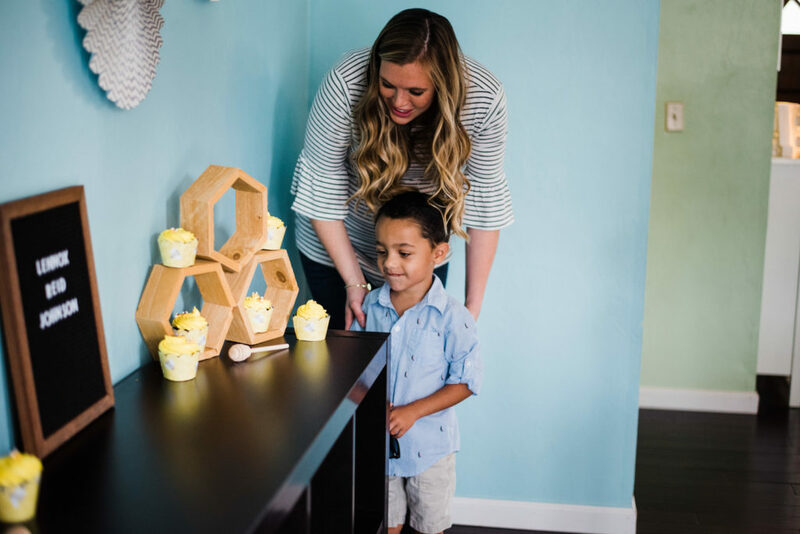 It’s always fun to have a themed photo backdrop at your party, and this Mommy to Bee had a gorgeous place to take pictures with her family and friends! 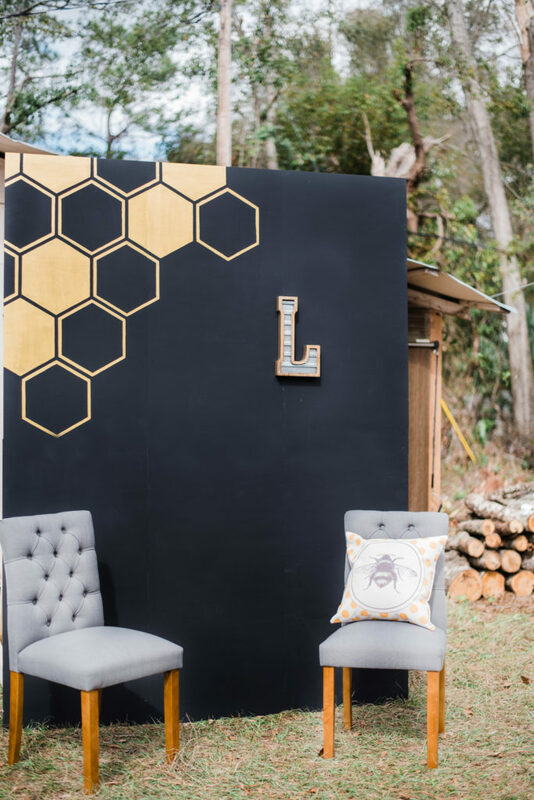 A black wall, built and painted by family members, was set up with gold honeycombs and a big letter “L” for the bay-bee’s monogram. Two chairs were placed in front which later served as a place for the Mommy to Bee to open presents. 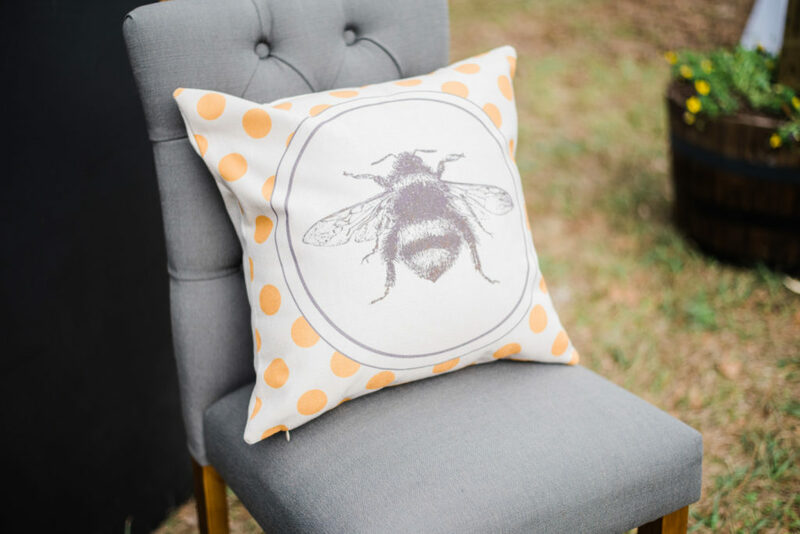 Don’t you just love the darling bee pillow as well? Big brother has the right idea eyeing those delicious looking beehive cupcakes, doesn’t he?! I just love the way they chose to display them on the honeycomb shelves. You can easily recreate this look by using the same darling bumblebee cupcake wrappers and edible sugar bees too! And how about this cheery yellow baby shower cake? 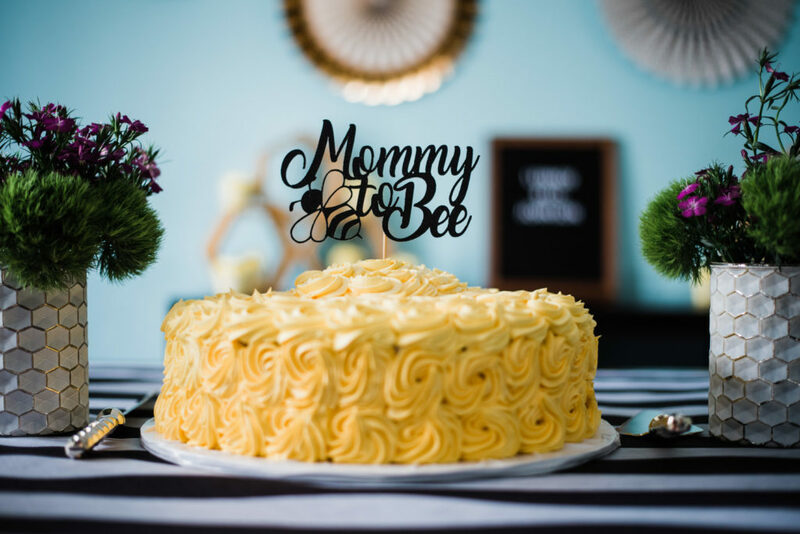 I just love the impact of its simplicity with the Mommy to Bee cake topper. 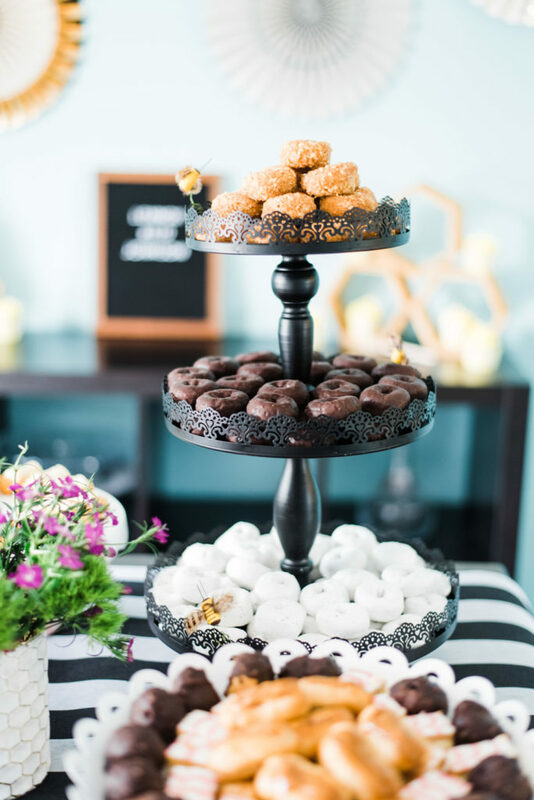 The cake was placed inside on the featured dessert table, which was decorated in blacks and whites. 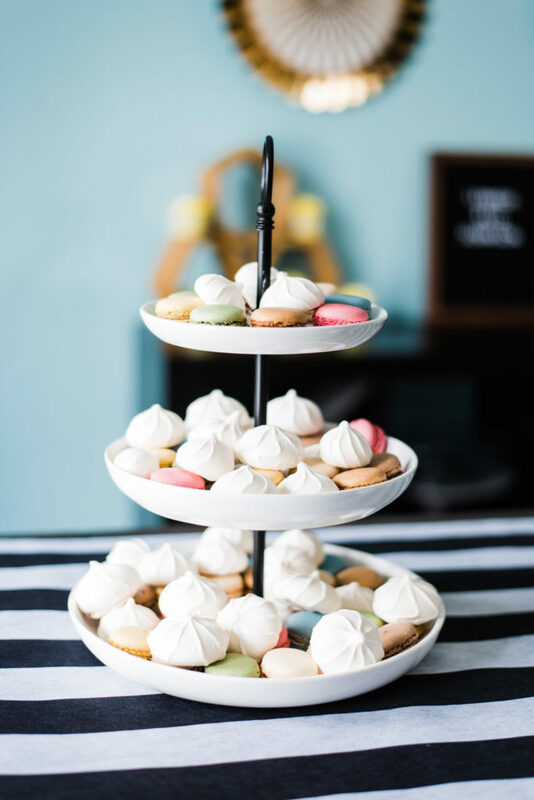 Store bought meringues, macaroons and donuts were placed on tiered serving trays and guests snacked on fresh fruits and an assortment of cheeses as well. 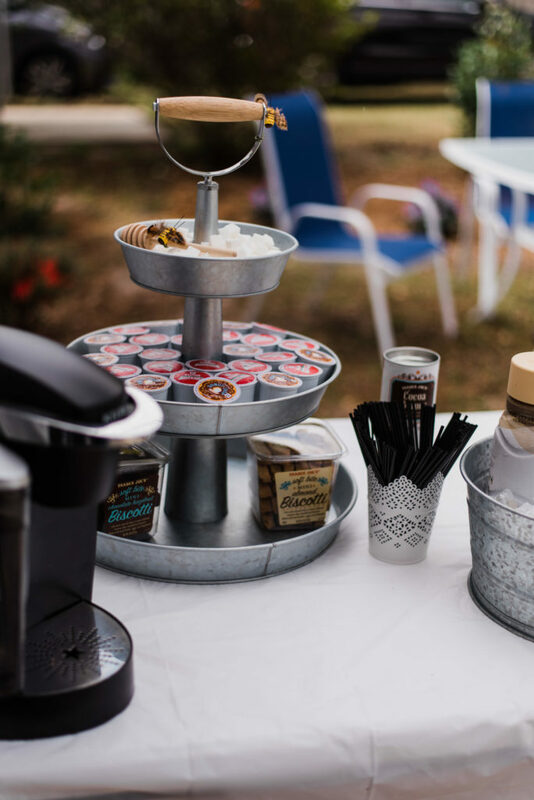 Outside, drink stations were set up featuring a DIY coffee bar, water and lemonade. 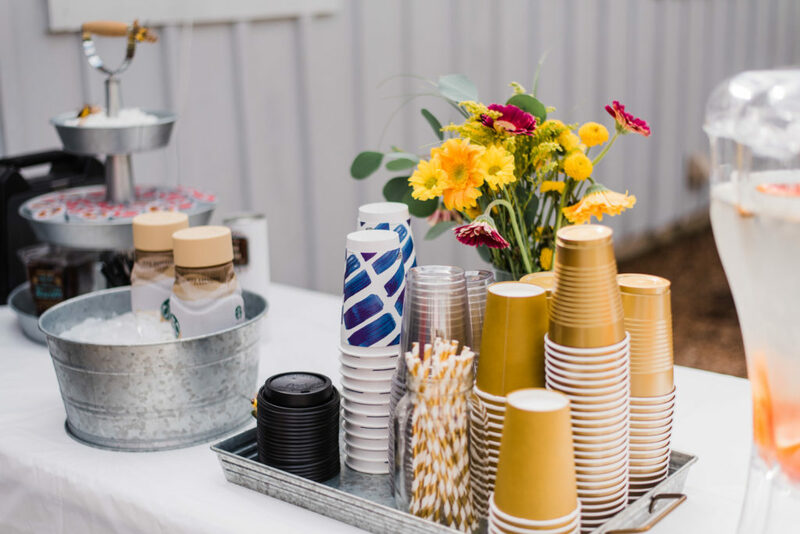 We love the gold party cups and striped paper straws as well! Do you see the cute honey stirrers and bumblebees with the sugar cubes? Such a cute touch! Inside the party favors were set up along another feature wall decorated with a gold metallic bee banner and a light up “BABY” sign. Guests were treated to bee butter lip balm and honey sticks made by a family friend who keeps bees! 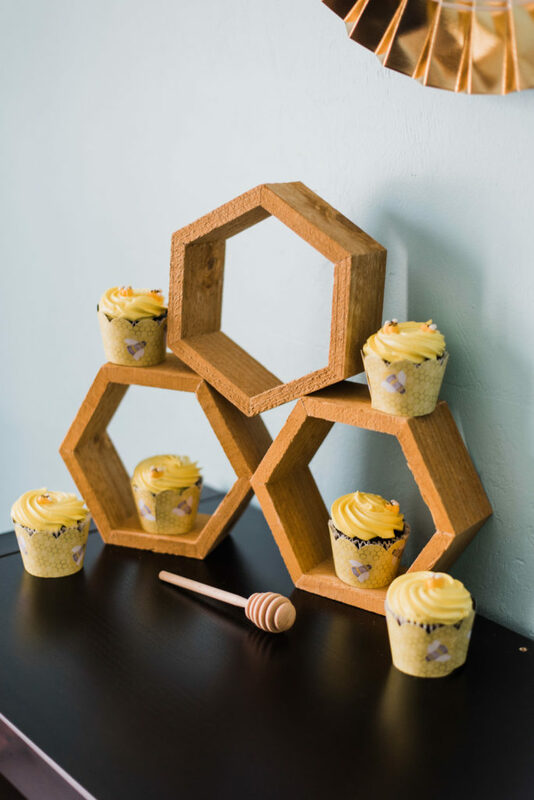 Absolutely perfect favors for a Mommy to Bee theme! 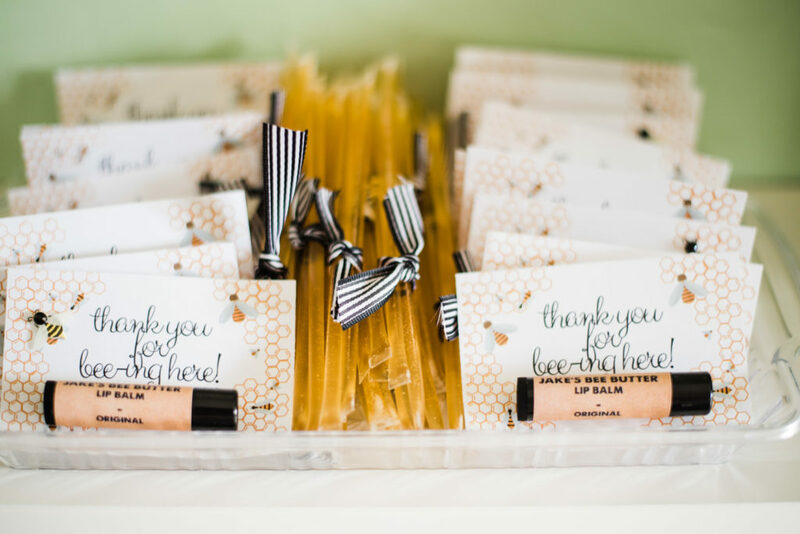 Kristen designed the thank you cards herself using Canva, but we found these editable bee-themed thank you cards on Etsy that would be perfect if you did a similar favor yourself! 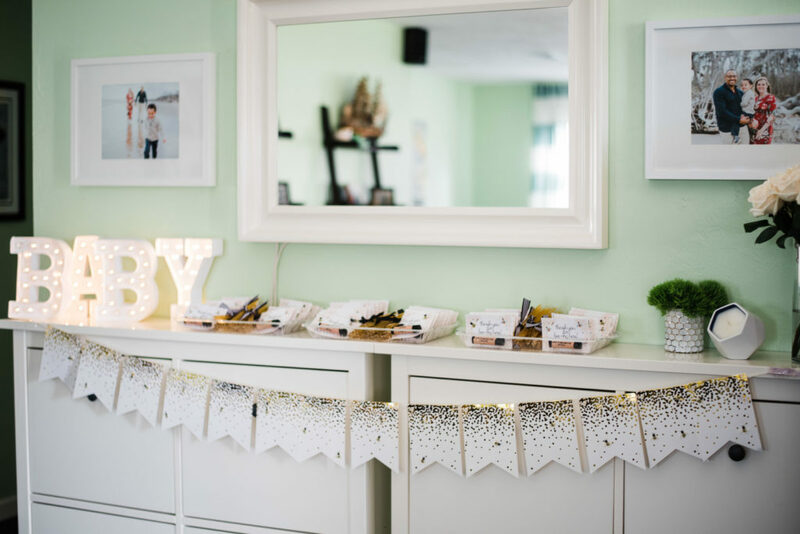 At the end of the day, a baby shower is all about quality time with family and friends and Kristen was able to create a relaxing environment for her sister to do just that! 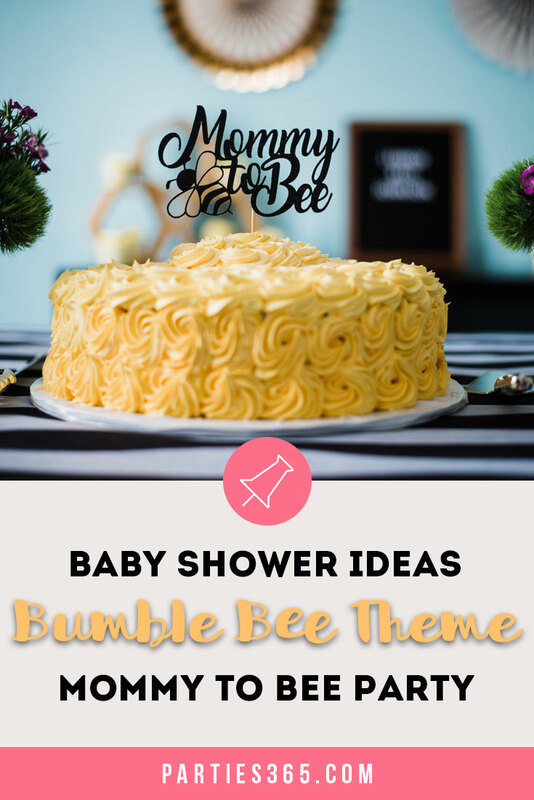 Thanks so much for sharing my sister’s shower! We got so many compliments on the party and it was so fun! Our pleasure! You did an amazing job – love your creativity and happy we could share it with our readers!